When I applied to private school for my daughter, I knew it would involve a lot of fundraising demands. Hey, even public school involves tons of fundraising. While most of it seems totally doable (hitting up grandparents for donations, for instance), there’s one part of it I really, naively did not anticipate: the Silent Auction. The Silent Auction appears to be a fundraising mainstay at private schools. In case you’ve been living on the moon and are unfamiliar with the Silent Auction concept, it means that parents with children at the school bid for various donated items, mostly so they fork over even more money to the school, but feel like they’re getting something out of it, too. Civilized lists are placed in front of each item, and people “bid” the price they’re willing to pay for each item. Fist fights are discouraged. But, occasionally spats do break out. Apparently, at one private school’s Silent Auction, the second place parent (in other words, the loser), after an argument over the bid sheets, took the item home anyway, and refused to give it to the rightful bidder. Apparently, the fight went on for months and the school administration actually had to get involved. Pretty petty. So who donates the items? Why, the parents, of course! Yes, the parents are expected (even required) to shill for at least two Silent Auction items. In a town rife with industry connections, this is simple for some: call in a favor or two for instant Laker tickets, or behind the scenes studio tours, or a weekend in Santa Barbara. But what if, say, you’re not particularly connected, or happen to be a semi anti-social writer who lives in her little room? What then? The pressure to donate items is huge. And there are criteria. The estimated value must be over $50. Things that are enthusiastically recommended are (the aforementioned) sports tickets, studio tours, and weekends away. Briefly, I considered begging the management at Street for a donated dinner for two. But then I panicked. Who the hell do I think I am, anyway? Why should that restaurant care about my kid’s school? Plus, every private school in Los Angeles is doing the exact same thing, every year. That’s an awful lot of free dinner requests for fancy private schools. Every time I thought about leaving the safety of my office and waddling up to Street, application in hand, my stomach clenched. In the end, a friend helped me out. I am eternally grateful. She is the Fairy Godmother of Silent Auction Items. So I got a reprieve this year. No waddling. I have another observation regarding the Silent Auction phenomenon. Generally, these events are so insular and circular. It’s not like the items are offered to the public (only a few school make their online auctions available to the public). The very same parents who pay tuition, and do annual giving, then supply the items and shell out for them, too. It’s like visiting the same watering hole every time, until it’s just a muddy, unproductive hole in the ground. The one school I’ve seen (not even a private school) that has a better concept is Larchmont Charter. Every year, it holds a photography Silent Auction event at a gallery in Culver City. The art is fabulous and the prices are good, plus the school is excellent at inviting other people besides parents to the event. I bought a photograph there about two years ago. It was a wonderful deal, and I love it, but now I can’t afford to go to the event ever again. I have my own auction to contend with. They need to offer financial aid for these auctions if they keep asking the same parents over and over again! The expenses could break our budget. I'm enjoying your blog immensely. 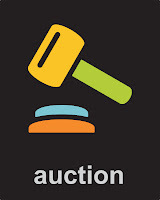 A Question about Silent Auctions. I’m new to the private school scene, but we just got a silent auction invitation for a school we were recently accepted to. It seems like it’s going to be a fun event and a chance to meet other new families (they mentioned there will be tables set up for new families). A friend of mine told me that I have to go, it’ll look bad if I don’t attend. It’s just that I didn’t know there was an upcoming auction, I didn’t even know what school my child was going to until a couple of weeks ago. The problem is, that date will be really hard for us to make. I can probably make it, but I know for sure my husband can not on that date. So I guess my question is, is it important we go, and is it normal to take someone else with me, like a friend, or a relative in place of my husband?